Super flavorful and healthy Cumin Roasted Chickpea Polenta Cakes topped with Better Bean Co.’s amazing Three Sisters Chili. Gluten-free, vegan, and packed with protein! I was recently given the opportunity to try Better Bean Co.'s products, and boy was I impressed! All of their products are Non-GMO, Gluten free, Vegan, Soy Free, Nut Free, Low Sodium, and packaged in recyclable, freezable, BPA-free containers! How cool is that?! Red Beans, Black Beans, Water, Onion, Tomatillo, Non-GMO Corn, Squash, Organic Poblano Pepper, Yam, Lime Juice, Olive Oil, Cider Vinegar, Garlic, Sea Salt, Organic Jalapeno Pepper, Ancho Pepper, Cumin, Oregano, Chipotle Pepper. Pure & wholesome as it can get! I really wanted to create something that would highlight and accentuate the beauty of this product, and this recipe did not fall short! Keeping in line with its ingredients, I decided to roast some polenta (corn) cakes, and top it off with some cumin flavored chickpeas. This turned out to be an amazingly delicious creation, full of varying textures, depth of flavors, and not to mention -- high protein power! I highly recommend you find your way to these amazing products, and discover the delicious possibilities for yourself! For now, dig in & enjoy. . . Dried or fresh cilantro for garnishing. To prepare polenta cakes: Preheat oven to 450°F. Line a cookie sheet with parchment paper, set aside. Slice polenta width wise into about 1/2" thick slices. Place slices on your parchment lined sheet. Sprinkle with salt + pepper, and drizzle with olive oil. Bake for 20 minutes, flip, and bake for 20 minutes longer or until desired golden crispiness.To prepare roasted chickpeas: Preheat oven to 425 F. In a bowl, mix together your chickpeas, salt, pepper, and freshly ground cumin seed. Mix in your olive oil & toss to coat. 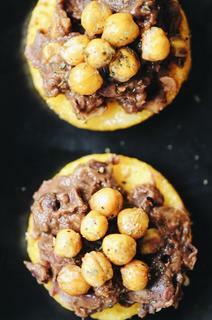 Place in a single layer on a cookie sheet & roast for 30 minutes or until desired crispiness.To assemble: Smear 1 tbs of Three Sisters Chili onto your hot polenta cakes & top with cumin roasted chickpeas. Sprinkle with cilantro and/or feta cheese before serving. Enjoy!